Other Such Happenings: Is there an entomologist in da hizouse? I saw this guy out in my flowerbed today. Ewwww!!! Maybe there were more bugs to eat on the dead plant? I have never been very good at bug or animal identification. Not even with a simple guidebook, y'all. Is there a studious entomologist out there that can help me? It was fun to see that my sister Coco had the same idea today! But she was smart enough to keep it wordless. I have always been know to let my big mouth get me in trouble and prove my ignorance. Maybe your dragonfly needs to meet my dragonfly and have little baby dragonflies. :P I'm interested to see if there are any dragonfly experts that might have some insight. Love you! That's some seriously sweet bokeh goin' on in those pics! I am no entomologist either, but what a pretty bug. 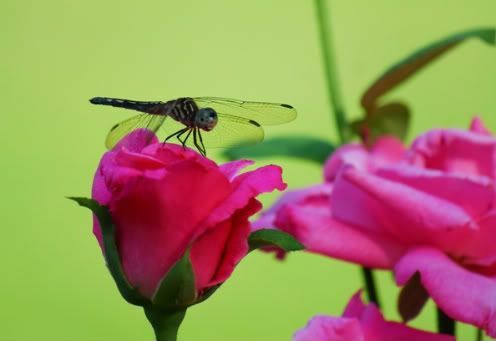 I love dragon flies. They have a beautiful mix of cute,creepy and interesting. I know one from school, but he studies mosquitoes. Well, I'm hopeless in that area, but I love the photos! Especially the first one! What's bokeh? Am I a freak for not knowing what that is? Never heard of it! I don't like too many bugs, but dragonflies, I do like. What I know about bugs wouldn't even fill a Barbie shoe! But I like your pictures. If that bug person ever lets you know what said dragonfly is doing, you really must post about it. I'm still stuck at "da hizouse"! 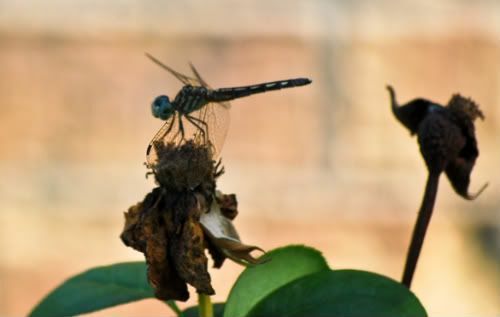 I don't know why he would be on the dead flower, but the heat of the sun is not good on their wings. Maybe he wanted shade? And I know that you can snap shots of them best early in the morning, because they are asleep until the air warms up a bit. Good shots here. this was taken late in the day-- maybe 6pm? lol it is warm all night long here in houston! blech. hot and humid 24/7.